The increasing demand for gasoline has led to the installation of many alkylation units to improve yields in refineries around the world. Alkylation units convert small molecular-size hydrocarbons, obtained in fluidized catalytic cracking (FCC) units, into larger, high octane gasoline components. These higher octane compounds provide a gasoline that burns cleaner and has better antiknock characteristics. The alkylation process, however, requires a strong acid. Sulfuric acid and hydrofluoric acid are the most common catalysts used in alkylation units. Hydrofluoric acid alkylation units (HFAU) generally consume less acid, can process a wide range of feedstocks, and produce higher octane components than sulfuric acid alkylation units (SAAU). However, hydrofluoric acid is a strong, corrosive acid and a powerful poison. If inhaled, it can lead to permanent damage to the lungs. In contact with the skin, it can cause severe burns. HF levels in the air may reach high levels without odor, and because it interferes with the way nerves function, burns may not be immediately noticed. Therefore, it is of utmost importance that you ensure the safe conversion of hydrocarbons in HF alkylation units by constantly monitoring the process and by avoiding all instances of vapor releases, fugitive emissions, and media leaks. Corrosion produced by the acid is an important concern in HFAUs. Using measuring instrumentation made of corrosion-resistant materials will minimize leaks due to material deterioration. WIKA has developed a special line of its All-Welded System specifically for HF applications. In this system, the Bordon tube and all wetted and non-wetted diaphragm seal parts are made of Monel 400. 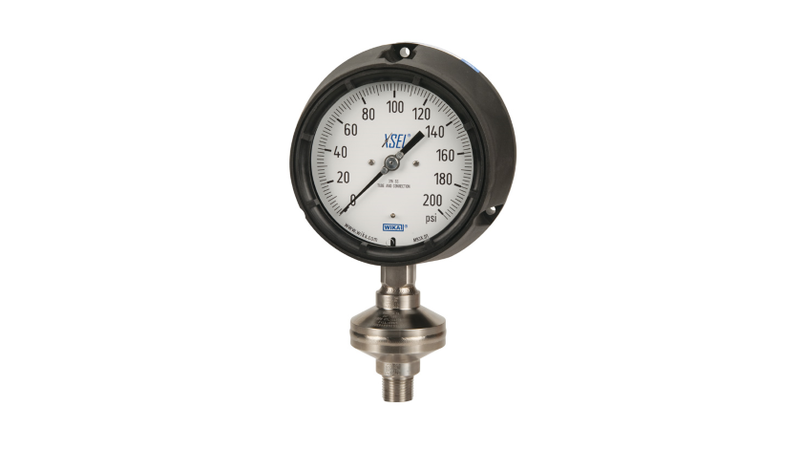 The diaphragm seal is back-welded to a process gauge to eliminate potential leak paths. An InSight ™ Glow dial face improves visibility in low light areas. The system comes in a yellow or a red case to differentiate it from other instrumentation that is not in contact with HF acid. For added protection, the seal is coated with an acid detection paint that turns from yellow to red when there is a leak. Both the dry and the liquid filled versions of this line of all-welded systems support EPA requirements for dual containment. For ultimate safety in HF alkylation units, WIKA also offers a Diaphragm Monitoring System (DMS). The patented design of this system features two diaphragm seals with a vacuum between them. A pressure transmitter, switch, or gauge monitors this vacuum. If the primary seal is breached, the vacuum is compromised and the system gives a visual, acoustic, or electrical warning. The still-intact secondary diaphragm prevents the release of the hazardous media into the environment, ensuring operator and plant safety. The Diaphragm Monitoring System can be mounted directly into the process or via a capillary line. A cooling tower can be added between the diaphragm and the measuring instrument. The corrosion and leak protection supplied by the built-in features of All-Welded Systems, and the early breach awareness supplied by Diaphragm Monitoring Systems provide the extra level of safety and reliability you want for your HF alkylation unit. Contact WIKA experts today to learn more about these unique solutions.